W Seoul-Walkerhill of W Hotels — the world's foremost "style" hotel brand of Starwood Hotels & Resorts Inc (www.whotels.com) — announces the impending launch of its truly stunning meeting facility the Great Room, which will open with the property in April 2007. Bringing success through stimulating you and your clients' five senses even in a serious and tensed business? Yes, that's real at W Seoul-Walkerhill's newly opened Great Room. Perfect for work and play, W Seoul-Walkerhill introduces its brand new meeting facility, GREAT ROOM featuring latest technology, creative catering, and innovative spaces — everything you need to make your business beautiful, meeting memorable and special event spectacular. The Great Room is a size of 221 square meters which can be divided into three rooms with a floor to ceiling window overlooking beautiful Acha Mountain. Meeting equipments such as 5 plasma LCD screens, individually controlled lighting system, high-speed wireless internet, state-of-the art AV equipment available with sensory setup. 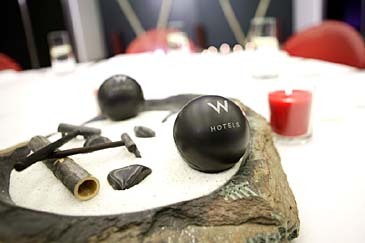 Sensory setup as a unique meeting style of W Seoul is designed to stimulate visual, auditory, olfactory, gustatory and tactile senses. It touches all the five senses with mood music, aromatherapy scents, thought-provoking placards, creative catering, retro candies and inspiring games that will help improve the effectiveness of meetings. Capacity of Great Room is 200 people for standing parties or 150 people for table dining setting parties. Moreover, the room can be set up with U type or lecture seminar style set up which is perfect for conventions and exhibitions. Mr. Nick Heath, the General Manager of W Seoul-Walkerhill said "I am very eager to further developing the already highly acclaimed urban resort, W Seoul-Walkerhill as a true meeting destination on the occasion of opening the Great Room and enthusiastically working for the opportunity to be one of the most vibrant, dynamic and stylish business meeting symbols in Asia. For those who are looking for a special and unique place for meetings, incentives, conventions, exhibitions and private purposes, W Seoul-Walkerhill will be the best place for you. You will be WOWed by our service which will bring you successful business."